Stanford’s undergraduate residential education program is undergoing a comprehensive review with the goal of improving the experience of living and learning on campus for all undergraduate students, according to leaders of the ResX initiative,who spoke Thursday at the first Faculty Senate meeting of the 2018-19 academic year. Also at the meeting, Paul Brest, professor emeritus of law and chair of the Advisory Committee on Renaming Junipero Serra Features, gave a presentation on the committee’s work earlier this year to develop the set of recommendations that led to the recent decision to rename some of Stanford’s buildings and other campus features. The 51st Faculty Senate is chaired by Stephen Stedman, senior fellow at the Freeman Spogli Institute for International Studies and professor, by courtesy, of political science. Maria Stefanick, professor (research) of medicine, serves as vice chair. Launched last spring, ResX is one of the first initiatives from the university’s long-range vision to get underway. 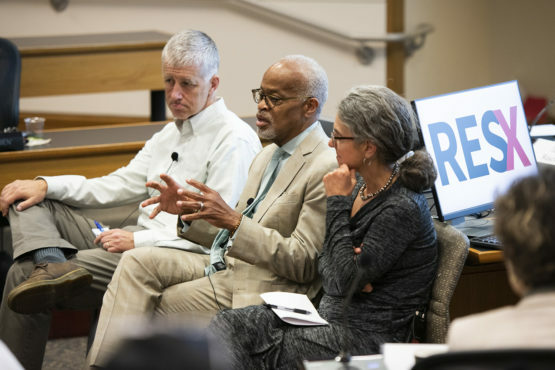 Charged with making recommendations for improving the undergraduate residential experience, the ResX task force is co-chaired by Vice Provost for Student Affairs Susie Brubaker-Cole and Senior Vice Provost for Education Harry Elam and includes faculty, staff, student and alumni representatives. In this effort, the ResX task force is taking a comprehensive approach, considering the many aspects of undergraduate residential life, including ideal housing configurations and shared programmatic space, staffing and governance structures, the housing assignment process, community-building programs and the entire experience for first-year students. “Now more than ever we realized that what happens in the residence has incredible impact on what happens in the classroom. The need to think more holistically about the environment of the undergraduate experience is what drives this effort,” said Elam. He remarked that students are faced with a great number of choices when it comes to residential life, which is not necessarily a good thing. “We want to find a system that is more intentional and comprehensive,” he said. Brubaker-Cole said that in its work to develop a set of recommendations, the ResX task force will consider the university’s commitment to belonging, health and well-being, community, and intellectual and personal growth. In the last five months, the task force has received input from hundreds of campus community members through in-person meetings, online town halls and website submissions. The task force has also reviewed relevant scholarship and analyzed previous data collected from the Stanford community. Over the summer, task force members visited the campuses of Dartmouth College, Harvard University, Rice University and Yale University to meet with peers and observe recent efforts by these institutions to reshape residential education. The goal for ResX is to deliver specific recommendations in a final report to Provost Persis Drell at the end of fall quarter with the intention of implementing changes by summer 2019. Jim Campbell, the Edgar E. Robinson Professor in United States History and a member of the Residential Programs Faculty Board, set the stage for the discussion by outlining the current residential landscape at Stanford. With 99 percent of undergraduate students living on campus, Stanford is one of the most residential universities in the country. He said that the university offers very diverse housing options with 85 different dorms, many of which are organized around themes or associations. Paul Brest, chair of the Advisory Committee on Renaming Junipero Serra Features, gave a presentation on the process the committee followed to develop its recommendations to rename some Stanford campus features named for Father Junipero Serra, the founder of the California mission system. Those recommendations were accepted by President Marc Tessier-Lavigne and approved by Stanford’s Board of Trustees in September. As a result, Serra Mall, the Serra dormitory and Serra House – currently home to the Clayman Institute for Gender Research – will be renamed. However, Serra Street on campus will not be renamed, and the university will provide educational displays and other resources to address Serra’s complex legacy. The committee – composed of faculty, students, staff and alumni – conducted extensive research and outreach before applying a rigorous set of principles that a previous Stanford committee had developed for considering the renaming of campus features named for historical figures with problematic legacies. Brest said that in making its recommendations, the committee acknowledged that Serra was a celebrated religious leader and an important figure in California history; however, he was also the founder of the mission system, which inflicted great harm and violence on Native Americans. The committee also took into consideration the current harms experienced by Native American students when encountering the Serra name on campus. “In the end, the principles call for a balance of interests: the harms to students and faculty weighed against the concern about being too ready to rename,” said Brest, noting that the committee was unanimous its recommendations. President Tessier-Lavigne responded to a question about the desire to name Serra Mall after university co-founder Jane Stanford. “Jane Stanford was extraordinarily important – crucial – in the establishment of the university … she worked alone for well over a decade to set the university on its course, thinking through in detail many of the issues in very thoughtful, deep and visionary ways,” he said. “She was very far ahead of her time in thinking about a university that is devoted to both fundamental research and applied research, open to all, that serves a purpose of upward mobility in society to advance individuals from all backgrounds and is dedicated to making contributions to the public good. “Was she perfect in all respects? No. But I think that would be true of everybody…. On balance, her importance to the university, her leading role and all the good that she did far outweigh the rest,” he said. Just as the university is planning to create educational displays about Junipero Serra, he said it would be appropriate to have signage on the street about Jane Stanford and the context of her life. In her report at the senate meeting, Provost Persis Drell noted the recent appointment of the Rev. Dr. Tiffany L. Steinwert as the new dean for religious life. Steinwert comes to Stanford from Wellesley College, where she is dean of religious and spiritual life. She will assume her new position in February 2019. Drell also reported that a search committee has been formed to propose candidates for the new dean of Stanford Law School. Current Dean M. Elizabeth Magill will leave Stanford in summer 2019 to become provost of the University of Virginia. The committee is co-chaired by the provost and Jane Schacter, the William Nelson Cromwell Professor of Law. Lloyd Minor, dean of the Stanford School of Medicine, spoke about the university’s opposition to two current ballot measures, Measure F in Palo Alto and Measure U in Livermore. Minor said that these measures would significantly affect the delivery of health care in those cities, including services provided by Stanford Health Care.